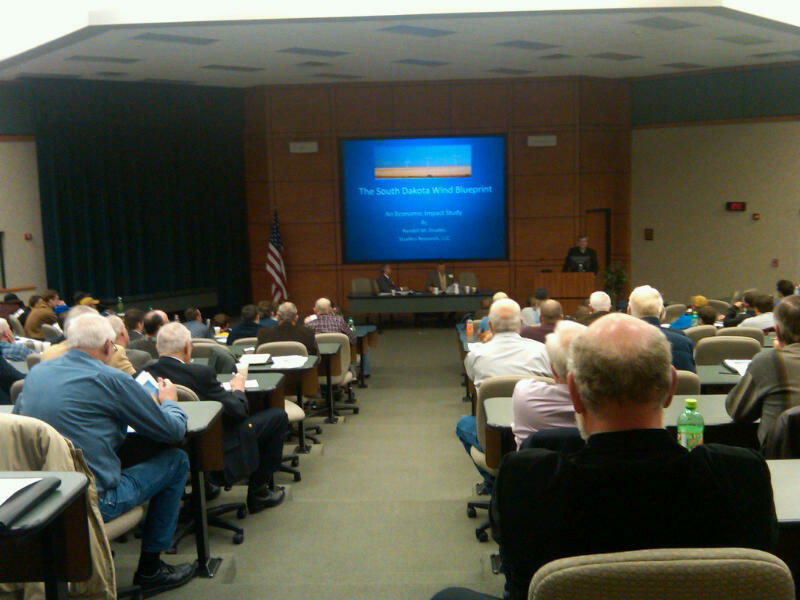 The SD Wind Energy Association (SDWEA) recently held their annual meeting and I had the opportunity to attend. Mitchell Technical Institute (MTI) hosted the meeting at its south campus location. MTI was a good fit for the meeting since they have a Wind Turbine Technology program. Hand County native Clayton Deuter made a brief appearance at the meeting in his capacity as Director of Admission for MTI. SDWEA supports the development of wind energy as a sustainable, economic, and environmentally friendly resource for all of South Dakota. On Hand Development is a member of SDWEA. We have supported the organization since its inception in January 2009. A new study entitled Envisioning One Thousand Megawatts of New Capacity and Transmission Assessment was distributed at the meeting. SDWEA commissioned the study and Stuefen Research prepared it. The study outlined the economic impact of adding 1,000 MW of capacity in Deuel and Brookings counties. The bottom line is that this type of project would have $2 billion of economic impact and would add over 5,000 full and part time jobs during construction. It would create 184 permanent full and part time jobs. While the numbers don’t translate directly to Hand County for various reasons, the study does give us an idea of the scale of this kind of project. For reference, the Titan I wind farm south of Ree Heights currently produces 25 MW of electricity and employs five people. If you would like a copy of the 1,000 MW study, just stop by the office. The presenters at the meeting noted that demand for wind-generated electricity is lower than previous years. The slowdown in the economy and the low cost of natural gas are the main causes for the drop in demand. This is a temporary situation and as the economy improves, the demand for electricity will increase. The folks from South Dakota State University that run the Wind Application Center and the Wind for Schools program gave presentations too. You may have noticed that Miller High School now has a Wind for Schools turbine installed. The electrical components still need to be installed. Once that is completed, the students can use the turbine to study wind energy in our own school. We will continue to monitor the wind energy industry and to support initiatives and legislation that will lead to wind energy development in our area. Our membership in SDWEA is an important component of supporting the growth of the wind energy in SD.